As a Maine wedding photographer I always recommend setting up an engagement session to all prospective clients. They can be any location that has meaning to the couple and allows us to create some amazing images without the time constraints and pressure of the wedding day. In this image Tiffany and Dustin enjoy a moment just after sunset at Halibut Point State Park in Rockport, Massachusetts. This is a gorgeous area with huge bolder rocks overlooking the Atlantic Ocean. We followed the short path to the sea, running really as the sun was rapidly setting. Luckily out timing was perfect and we got some wonderful shots with time to spare. The peninsula at Hilibut Point allows for a unique shot here on the east coast with the sun setting over the ocean. 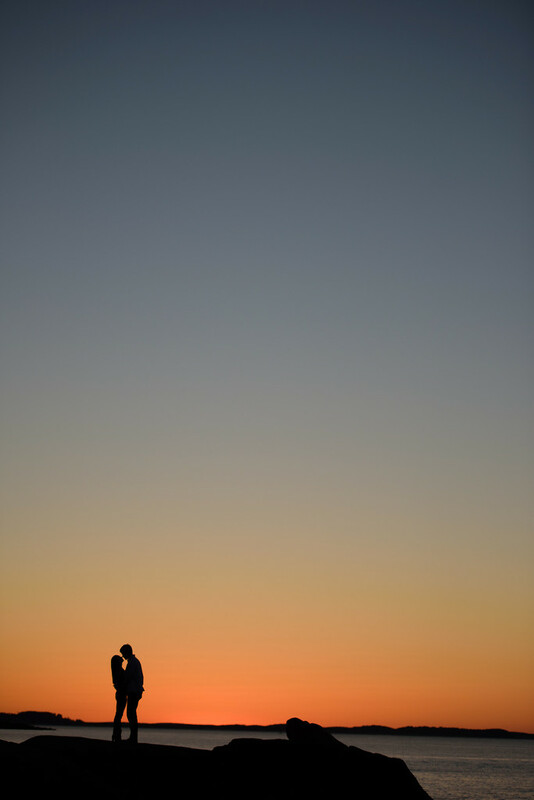 This shot was taken with a long telephoto lens to compress the background and create a lovely silhouette of the couple. It was a perfect evening, cloudless and just a bit of crisp coolness in the Autumn air. I am looking forward to their wedding next year in 2016. Location: Halibut Point State Park, Massachusetts.